JANUARY, Thursday, 21 – Annual Meeting 6:00 pm, finger food, 7:00 pm business meeting, St. John’s Episcopal Church, 290 Old Haw Creek Rd. MARCH, Saturday, 12 – Pot Luck Supper, 6:00 pm, St. John’s Episcopal Church, 290 Old Haw Creek Rd. APRIL, Tuesday 12 – Educational Program, 7:00 pm, St. John’s Episcopal Church, 290 Old Haw Creek Rd. MAY, Saturday, 14 – Spring Yard Sale, set-up 8:00 am, sale 9:00 am – noon (rain date 21th), St. John’s Episcopal Church, 290 Old Haw Creek Rd. JUNE, Tuesday, 21 – Board meeting, open to the public, St. John’s Episcopal Church, 290 Old Haw Creek Rd. JULY, Tuesday, 19 – Annual BBQ, 5:30 – 7:30 pm, St. John’s Episcopal Church, 290 Old Haw Creek Rd. SEPTEMBER, Saturday, 10 – Ice Cream Social, 2:00 – 4:00 pm, St. John’s Episcopal Church, 290 Old Haw Creek Rd. Once again Haw Creek Community Association would like to thank St. John’s Episcopal Church for welcoming HCCA and the use of their fellowship hall in 2016. Being left without our community center, which was leased to LEAF for 5 years at $1.00 per year, we would not be able to offer our community these events without St. John’s Episcopal Church. Why Haw Creek residents must come together and make their ideas for how we will look 5 years from now as a neighborhood and what will changes to the UDO do to my property values, way of life, traffic, infrastructure, etc. Neighborhoods in the city for the upcoming revisions that will be done over at least a 2 year period to upgrade the UDO and the Comprehensive Plan. We had 27 other neighborhoods there along with Planners, other City Staff, presentations were done by neighborhood associations that have registered plans for their community that took hard work, community input over several years, and then was accepted by City Council. Why should we care? If you do not have a plan in place, commercial intrusion into neighborhoods is being tried all over Asheville, people that live in the neighborhood should have a say as to how it will grow or change. We do not want a consultant or City staff to be the only persons with input on Haw Creek. Comprehensive Plan tells the City what residents want to see for their future and is a guide. The UDO is an ordinance (law) and will impact us because the City wants to have much more density among other things in Haw Creek and other areas. We must chart our own future. I don’t want 8 or 16 units per acre, I don’t want our roads so clogged we can’t get in and out of the valley – these are just a few things that will be dealt with. But I urge you when the Haw Creek Association meets in January please be there to hear and ask questions. The RFP is ready to hire a consultants group from out of town or state to get this process started. Barber Melton, is a Haw Creek Board member, member of Neighborhood Advisory Comm. and Co-President of Coalition of Asheville Neighborhoods. During 2016 calendar year, the Coalition of Asheville Neighborhoods (CAN) will have a program scheduled for every other month, which will alternate with business meeting for the other months. These programs will provide you with an opportunity to engage Asheville’s leadership to discuss current and emerging neighborhood-based issues or perhaps preferences that are most important to you. Our January 11th meeting will have the newly elected members of Asheville’s City Council. With an informal format and joined by your fellow neighborhood leadership, you will have an opportunity to ask questions, voice concerns and get to better know these members of Council. Empowering Neighborhoods since 1986, CAN is a 501(c)3 non-profit, all volunteer umbrella organization serving Asheville’s neighborhood organizations. Call A Ride (CAR) is a volunteer transportation program that provides rides to seniors who can no longer drive or access public/community transportation (ART, Mountain Mobility, etc.). Volunteers use their own vehicles to transport seniors to their appointments, the grocery store or to meet other needs such as haircuts or voting. Socializing with seniors volunteers provide social interaction, mental stimulation, and emotional support to local seniors. The roles of the socializing with senior’s volunteers are to keep the senior connected with the community and the outside world, and to reduce the individual’s sense of isolation. Volunteers assist a senior in maintaining feelings of independence and self-worth, and to increase their social contacts while maintaining professional boundaries. 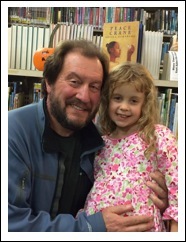 Lucia Hess, age 5 pictured at left with her father, was the winner of the Grade K-2 drawing contest for the n ew library. She won a gift card from Dancing Bear Toys! 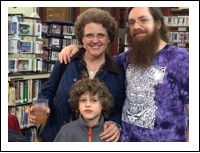 Mitchell Cohen, age 8 pictured above with his parent Kim and Dave, was the winner of Grades 3-5 essay contest. Mitchell won $25.00 and read his essay to the County Commissioners at their monthly meeting on December 2. Congra tulations to our winners. Did you know Haw Creek Community Association’s annual dues are only $12.00 per calendar year? They are payable the 1st of January and can be paid in person at our annual meeting, through PayPal by going to our web site www.hawcreeknc.wordpress.com or mail a check to: HCCA, PO Box 9193, Asheville, NC 28815. We do many events each year, some of which are member only; our annual BBQ offers a member discount on dinners; we have four newsletters, one, which is mailed, and three via email. Look for our event calendar in this newsletter, at the annual meeting, on our web site and Facebook page. We are a great community and hope as a resident you join HCCA. Cough, cold, and flu season is upon us! Even healthy people are susceptible to the flu, and it can be serious. Everyone 6 months and older should get a flu vaccine unless it is contraindicated due to severe allergic reaction or previous adverse reaction to a vaccination. Protect yourself, your coworkers, and your loved ones by washing your hands often and getting a flu vaccine this season! What is the flu? Both the flu and the common cold are highly contagious viruses, not bacteria. This is why antibiotics do not work. When should I get vaccinated? As soon as vaccines are available each year (usually September), but at least by October. It takes 2 weeks for your body to fully develop immunity from the vaccine. Can the flu be treated? Antivirals, such as Tamiflu®, can help shorten the duration of flu symptoms when started within 48 hours of symptom onset. Fever and pain can be treated with Tylenol® (acetaminophen), Advil® or Motrin® (ibuprofen), or Aleve® (naproxen). A dry cough and sore throat can be treated with cough medicine such as Delsym® (dextromethorphan), cough drops, and throat lozenges. **Caution** Read over-the-counter (OTC) labels carefully as many flu and cold products contain multiple and similar ingredients which can be dangerous when taken together. Always talk to your healthcare provider or pharmacist before taking any OTC medication. How do I know if I have the flu or a cold? Please see the chart below to help you determine if you have a cold or the flu. If you think you may have the flu, you should call your doctor’s office for guidance as certain populations are at a higher risk for serious complications. Only your physician can offer a definitive diagnosis.